Wrap the haggis in foil, place in a pan and pour boiling water half way up it. Cover and simmer for 45 minutes. Put the diced potato in an ovenproof dish. Drizzle with olive oil and roast for about 40 minutes. Peel and dice the swede and turnip and put in a saucepan with boiling water. Cover and simmer for 25 minutes until very tender. When the meal has only a few minutes of cooking time left, make the cream sauce. Make up the gravy with 100ml boiling water and place in a saucepan with the cream, mustard and chives. Simmer for 2 minutes, then turn off the heat and add the whiskey. Pour the swede/turnip into the potatoes and mash roughly with a little butter. Unwrap the haggis and cut in half. 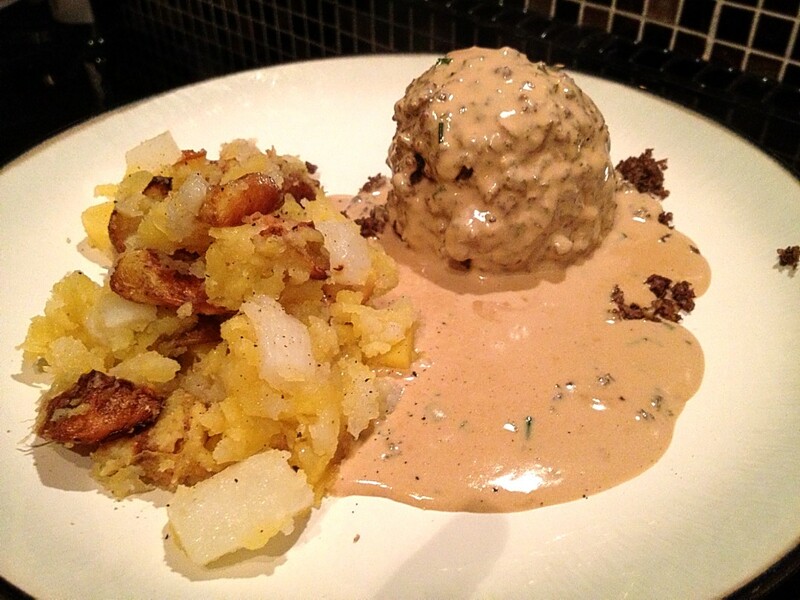 Squeeze out each half of the haggis onto plates and pour over the cream sauce. Serve with the neeps and tatties. This is a variation on the classic Scottish dish, so I hope I do not offend any Scots. Th sauce goes really well with steaks of beef as well.